As it is often said about camp-time, a day feels like a week and a week feels like a day. This wee k has been no different, with each day from kimah (wakeup) to lila tov (good night) being filled to the gills with fun and active peulot (acitivites). At the end of the week we all feel like the time has truly just flown by! We had an awesome peulah on Shabbat morning, learning about the physical differences between Sephardi and Ashkenazi Torahs, as well as the different cantilations each group sings. 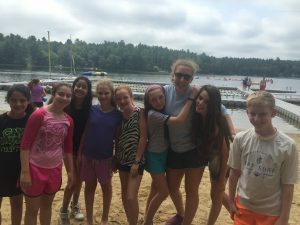 The rest of Shabbat was filled with rousing ruach (spirit) and a healthy amount of free time allowing the chanichim (campers) to enjoy the day in the ways best for them. On Sunday, we enjoyed a wonderful, sunny day filled with sports and swimming. 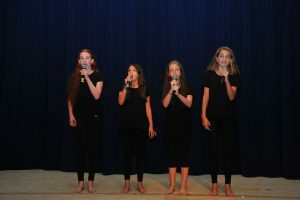 On Sunday evening, Yavneh had the special honor of hosting the Jewish Arts Festival, in which six other different Jewish camps from all around New England came together to give wonderful performances of song and dance. The theme of the night was matanot k’tanot, or small gifts. Each camp interpreted this theme slightly differently, and it was truly special to see so many camps give it their all. Yesterday we are enjoyed the annual Yavneh varsity basketball tournament. We had so much fun watching the games! B’ahava – Herschel, Aviv (Roshei Ayda, Heads of Unit) and the rest of K’firim ’15! !